• the map with Russian starting positions. We hope that they will be of use and interest to others. If you do use them, please acknowledge and link to our group. What a well-done project! Your write-up and these lists are extremely useful as well. Here is a quick question; you have listed the Russian Guard Heavy Cav. (Chevalier Garde, Lifeguard Cuirassiers, etc) as Cr, while the Lifeguard Dragoons are the only Russian cav. unit rated as GHc. You certainly know more about this than I do, but I am curious to know why you apply these ratings. I had an idea that the Guard cuirassiers were very good formations, perhaps I am mistaken. Thanks Millsy, Phil and Jim for your positive comments, they are most encouraging. 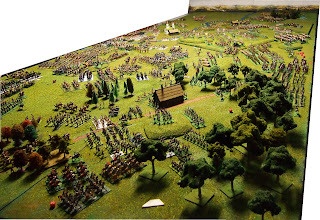 I am working on the final, full battle report for this game which I hope to post sometime this week (with lots of photos). Great question Jim, you have had a good look at the lists! The answer is two-fold, firstly it is an error/inconsistency on my part—all of them should be rated as GHc! Secondly, and why we did not pick it up in the game, is because it does not matter or make a difference in the Shako rules as GHc and Cr have the same morale value (6).